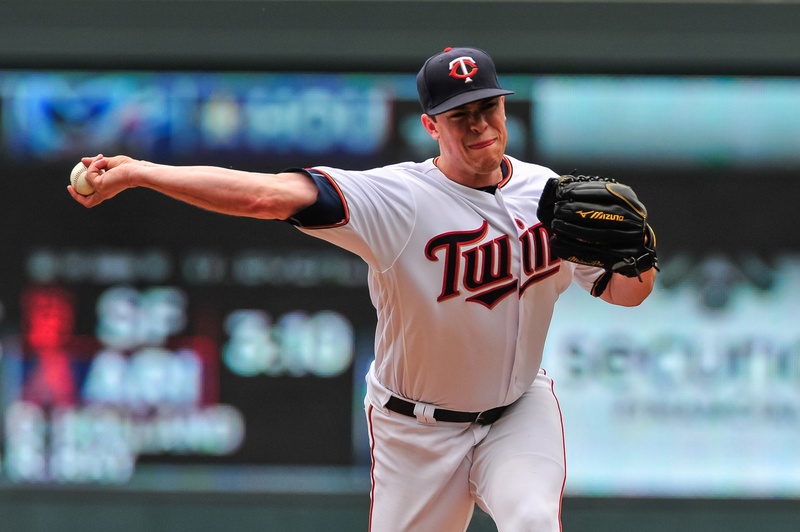 Following the trade of Fernando Rodney, the role of closer has been undecided but Trevor Hildenberger seemed as good of a replacement as any for a team that was clearly focused on the future. There was adequate enough reason to give Hildenberger a chance to convert saves. For starters he had performed well in the first-half of the season, striking out about a batter per inning and allowing just five home runs over 43 appearances. He also had the longest name of any member of the Twins’ bullpen. That had to account for something. Even before Hildenberger was asked to save games his performance had started to get shaky. Hitters who had once flailed at fading changeups and frisbee sliders were beginning to square them up. The regularity of which his secondary offerings were pasted around the field even incited the Twins to walk out the dreaded t-word: Tipping. According to the Pioneer Press’s Mike Berardino, manager Paul Molitor said that the team’s video scouts were scouring through tape to find any signs of tipping from Hildenberger, but Molitor felt that there wasn’t any signs of tipping. If that is the case how is it that opponents have gone from hitting .120 with nine extra base hits on his changeup and slider from the beginning of the year until July 15 to hitting .454 with eight extra base hits since July 15? The first element of Hildenberger’s second-half issues is predictability. There were patterns that started to emerge from early in the season that may have influenced the results in the latter portion. In his appearances against the Rays in Tampa, Hildenberger didn’t allow a hit off his secondary stuff. In the recent series in Minnesota, the Rays were 4-for-4. Joey Wendle was one of the Rays hitters to reach against his changeup. In the first two matchups in Tampa, Hildenberger struck Wendle out but he may have left a bread crumb for the left-handed hitter: In both meetings, Hildenberger threw a 1-1 changeup to him. At Target Field, facing yet another 1-1 count Wendle sat on Hildenberger’s changeup and laced it into center field for another hit. Another example was his battles with the Royals’ Whit Merrifield. From May 28 until July 21, Hildenberger faced Merrifield four times. In each occasion, Hildenberger started Merrifield off with a slider. The fourth time around Merrifield swung at the slider and knocked a single. In two ABs since that hit, Hildenberger has started him off with sinkers. But while the Royals and Rays did a number on Hildenberger, it has been the Cleveland Indians who have inflicted the most damage. Prior to the rough stretch, Hildenberger made three appearances against the Indians. During those appearances, he held the Indians hitless against his secondary pitches (0-for-5 with 2 strikeouts). Since July 15 Hildenberger has made four additional appearances against Cleveland and has had the same lineup trash his secondary stuff (6-for-12, 2 HR) -- including Francisco Lindor’s game-winning walk-off home run on August 8. What led up to Lindor’s game-winning tank shot? Leading into that August 8th match-up, Hildenberger had faced Lindor five times in 2018. In three of those occasions he started Lindor off with a changeup. If you are Lindor, chances are you can sit on the changeup and take a Daddy Hack. Hildenberger faced Jason Kipnis twice this year. Once at the beginning of the year where he started him with a sinker then two changeups in a row. In their second meeting -- an at-bat that preceded Lindor’s home run by two hitters -- Hildenberger once again started him with a fastball and then threw two changeups -- the second of which Kipnis lifted into left field for a base hit. The second element that may be behind Hildenberger’s struggles is a combination of the predictability and, yes, some pitch-tipping. According to Berardino’s article, Molitor appeared fairly confident that Hildenberger was not doing anything explicit to tip his pitches (flaring his glove or slowing his delivery to telegraph a particular pitch). And that may be true. But before we outright dismiss it, let’s consider there does seem to be a window in which Hildenberger could be tipping his hand. When Hildenberger breaks his hands, he does so away from his body. While he contorts, twists and bends, there appears to be a momentary flash where hitters can see the ball in Hildenberger’s hand. Compare Hildenberger’s away from his body hand break approach to the Padres’ submarining reliever Kazuhisa Makita. Makita keeps his hands close to his body and doe not give the hitter one iota of a glimpse at the baseball until it is frisbeeing towards the plate at the opposite of breakneck speed. This slow motion side angle demonstrates how Hildenberger drops his hand from his glove with the circle change grip (the OK sign around the ball) facing the hitter. Most people will obviously say that’s an easy thing to pick up in slow motion but near impossible to decipher in real time. That’s where hitters like Alex Rodriguez and Frank Thomas would tell you you are wrong. In breaking down the changes Yankees’ starter Luis Severino made, Rodriguez commended the pitcher for hiding the ball more, starting his hands at the belt and breaking them behind his leg versus out away from his body. As Rodriguez shows in the video below, even a brief flash of the changeup grip would tip off a hitter. While not every team may be wise to his, the Indians may be one ballclub that has picked up on it. With the familiarity and perhaps an extra advantage in knowing what pitch may be coming, it wouldn’t be surprising to hear this is why Cleveland has been able to batter Hildenberger around so much in July and August. Again, the latter portion of this is a theory. The Twins have multiple camera angles, such as views from behind home plate, that could confirm this. Plus, if he were tipping, one of the members of the catching crew -- either Bobby Wilson or Mitch Garver -- likely would have mentioned something to the staff. If hitters are seeing something, catchers should definitely be able to as well. That being said, the Twins have little incentive to acknowledge or broadcast the notion that Hildenberger’s tipping pitches. If his mechanics are giving something away -- and again, IF -- the Twins would most likely want to get him quietly to the offseason where they could begin to address it (hiding the ball better like the aforementioned Makita). Hildenberger has proven himself in the minors. He has proven himself in the majors. All relievers...starters for that matter...go through ruts. The fact that Hildenberger himself feels he's been tipping something speaks volumes to me. Agreed, the Twins would be silly to just broadcast something like this. So I will not bang on them as being ignorant of the things you've suggested and posted. What's IMPORTANT is not what they say, but what they do going forward to correct. Or, Hildenberger could learn to change from one grip to another after he breaks his hands. Boy, would that make some hitters look foolish. Have him ONLY face RH batters, no switch hitters who would bat LH and no pure LH batters unless the bases are empty and the game is not on the line. It stands out a mile once it's pointed out. I never would have picked up on it. Outstanding contribution! This is why I pay Chief the monthly membership fee to belong to this site. Good analysis.I think the grip may also be visible during Hildy's 'backswing' (not sure if there's a better word for it).He brings his pitching hand way out toward first base where it's very visible.Watching your clip of Makita, he brings his 'backswing' shorter and toward second base to hide the ball the whole way. Very interesting to see in slow motion. Thanks for the information! That's why Cleveland does too! Didn't seem to help that batter. Yeah, the rub is you have to be able to hit it. Shawn Green wrote an excellent book -- The Way of Baseball -- which details his experience uncovering some of the game's best pitchers during his era and their tells. Names like Maddux, Randy Johnson and Curt Schilling make the list. He also talks about Brad Radke's notorious glove flare on a changeup tell. Knowing what is coming might give the hitter a slight advantage, it usually takes a combination of pattern, tip-off and ability to hit that pitch. The advantage of identifying the tell is partly off-set by the fact that the batter, in looking for the tell, is compromising his focus/view of the release point. Did his delivery change? If not, why was he missing bats before if this is as obvious as A-Rod says? As far as the pitch selection and sequence to specific batters, isn't that partly on the catcher to study previous ABs and not call the same sequences over and over? Unless of course the pitcher is shaking off signs. Hildenberger has better numbers, both career and this year, against lefies than he does against righties. That's a good question. You'd think there could be some data that would help avoid situations like this. But if you do look at the data, it would also say you were successful with that pattern. The other interesting thing is how much better Hildenberger has been with Wilson (572 OPS in 71 PAs) over Garver (914 OPS in 120 PAs). It could all just be noise or small sample size but it would be interesting to breakdown their pitch selection. I don't think it is quite as easy as ARod says. It takes some familiarity. You face a pitcher a couple times, you learn a bit of his tendencies and someone tips you off on a player's tell and you now have something to look for. If you are sitting change-up and he gives you a quick confirmation of that, that's an advantage. Not every player is going to see it and not every hit means that player saw something. He is overworked this year for sure! This might be kind of telling since it seems that righties would be more able to pick up his grip from their angle in the box whereas lefties would be more blocked by his body. The evidence from Parker is certainly suggestive.I don't know if this is his main issue but it seems plausible.